As we all know, SQLite is a great and popular local database running on mobile devices. Consider of its powerful and useful features, lots of apps use SQLite database as the main way of application data storage, including Android and iOS apps. What's more, SQLite is a cross-platform database and also have windows version so that windows apps are easy to integrate with it. Today I will give a lesson about using SQLite in UWP project. And we need to add the VC++ 2015 Runtime refrence too. Secondly, we need to add a framework named SQLite.Net for using SQLite effectively. In other words, SQLite.Net libary will help us access sqlite database more esaily. 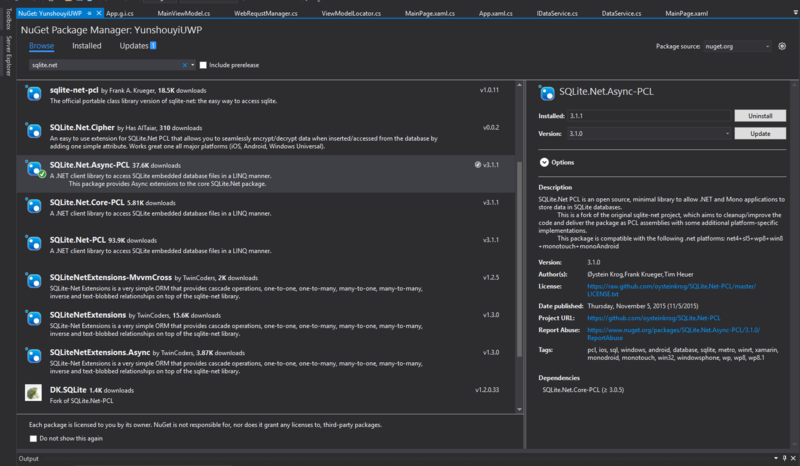 It have some relese versions which you can find in NuGet, and two of them are most useful, including SQLite.Net-PCL and SQLite.Net.Async-PCL. What's the defference between SQLite.Net-PCL and SQLite.Net.Async-PCL framework is that SQLite.Net.Async-PCL support asynchronous operations. Actually I like async-await more, so I will install SQLite.Net.Async-PCL framework. Once we finish configurations, we can write some code to use SQLite now. Let's we have some interesting codes to begin using this amazing tool now. What's more, I will provide some example codes written by myself for you. 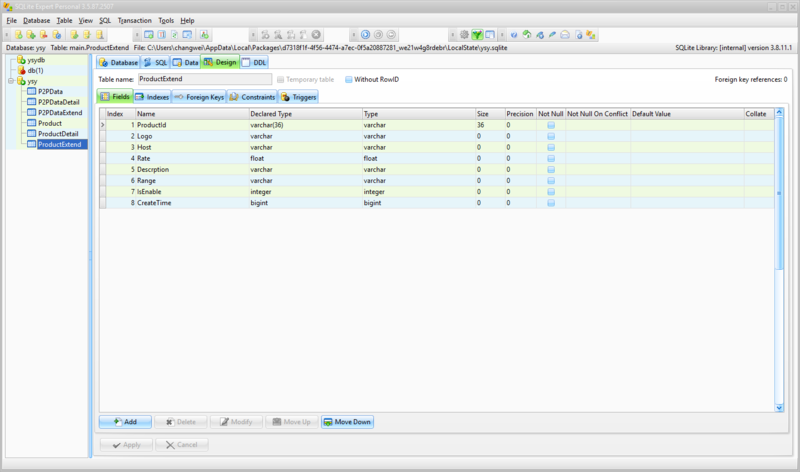 The mainly code is used to manager local SQLite database file and access it more easily, so I named it SQLiteDBMnager. Before we access the data of database, we need import and manage the database file. 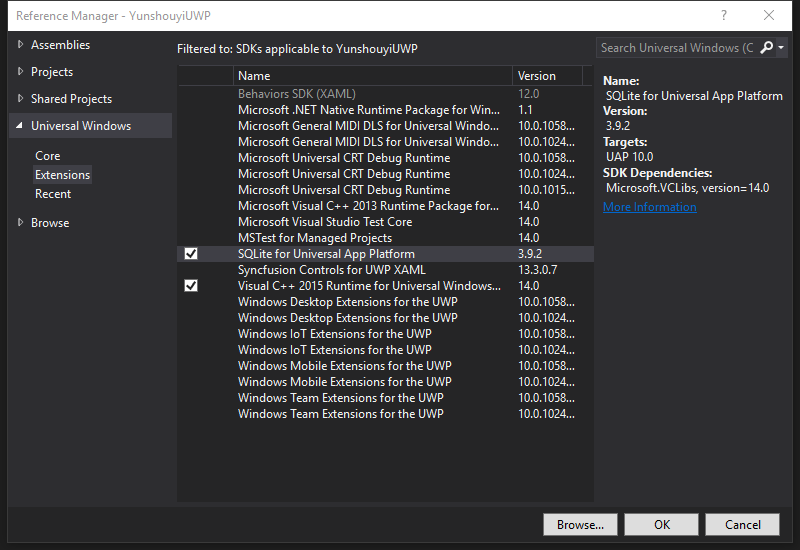 In windows runtime framework we need to move or create database file in ApplicationData folder. And you can create a database file using SQLite Expert which is famous manage tool for SQLite database. After we initialize database, we need to access the data of database. Fortunately, SQLite.NET provides some method for us, but we still do some works to simplify codes. You can get entire file here. SQLite database is a good choice as application data storage container, and more excellent that ApplicationSettings and Xml/Json data files in many ways, I think.